The USS Intrepid sailed out of Pearl Harbor on Jan. 16, 1944 and headed for Kwajalein Atoll in the Pacific during World War II. 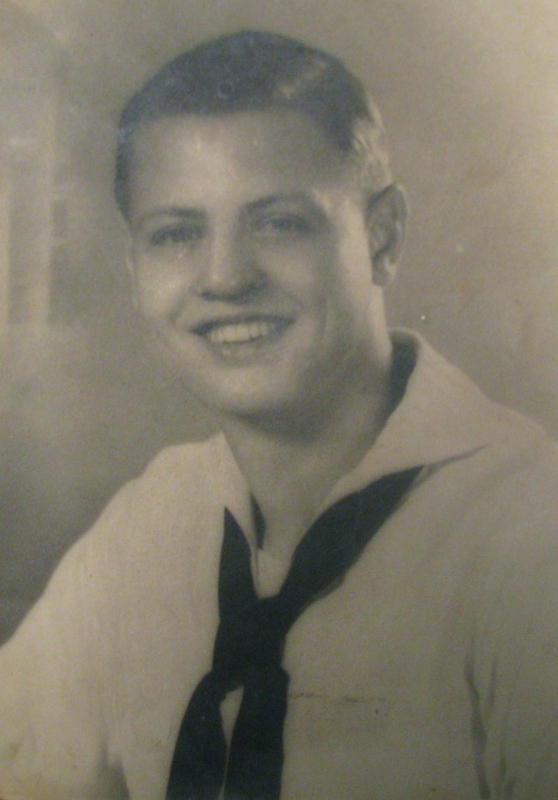 Fred Sauer of Arcadia served as an aviation electrician’s mate aboard the aircraft carrier. His job was to make electrical repairs to the F6Fs “Hellcat” fighters, TBF “Avenger” torpedo bombers and SBD “Dauntless” dive-bombers aboard the carrier. During his tour on the ship Sauer served as Acting Chief Electrician’s Mate in charge of keeping the electrical systems in 100 planes working. “We captured Kwajalein and Enewetak in the Marshall Islands during our first island hopping campaign. Our raids destroyed all of the Japanese planes based at Roi-Namur, some 100 enemy aircraft,” he said. “Early in February 1944 the Intrepid attacked Truk, a major Japanese repair base. It was the equivalent to Pearl Harbor, the Japanese repaired all their ships at Truk. 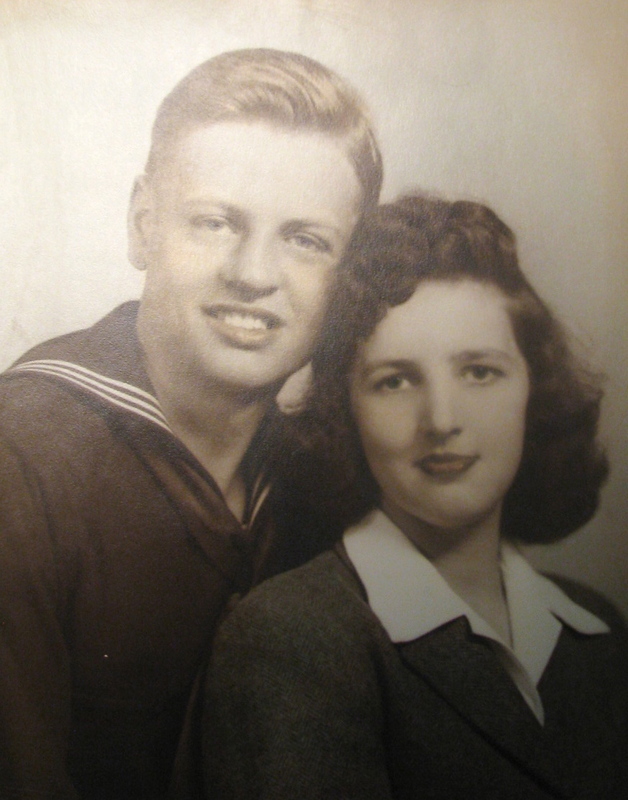 “On Feb. 17 we pulled out of Truk on my dad’s birthday, and headed for the open Pacific. An enemy plane came after us and caught up to us about noon. My battle station was in damage control. We were quartered on the fantail of the carrier,” he said. “We had been at general quarters for days. About noon I asked the officer in charge if I could go inside the hanger deck. I knew there was an engine cover I could sleep on. I went in and laid down on the wooden box. “Right about noon there was an explosion and I was knocked off the engine cover. When I came down I hit a metal engine stand and hurt my back. Shrapnel hit right beside me during the attack,” Sauer recalled. “An enemy torpedo hit an outside 40 mm gun tub on the fantail of the ship and killed 11 sailors and injured many more. I heard these men screaming until they died. It still gives me nightmares even to this day,” the old sailor said. “The enemy torpedo knocked out our rudder on the starboard side and one of our propellers on the same side of the Intrepid. We had a terrible time getting back to Pearl Harbor for repairs. A boatswain’s mate put some planes with their engines running up on the forward side of the ship to pull us along and help steer the carrier. We also rigged canvas sails. That’s what got us back to Pearl. “I laid around aboard ship because I didn’t want to go to sick bay even though I was injured. Everybody knew when we got back to the States we’d get 30 days leave. I didn’t want to be in sick bay when leave was granted to the crew. 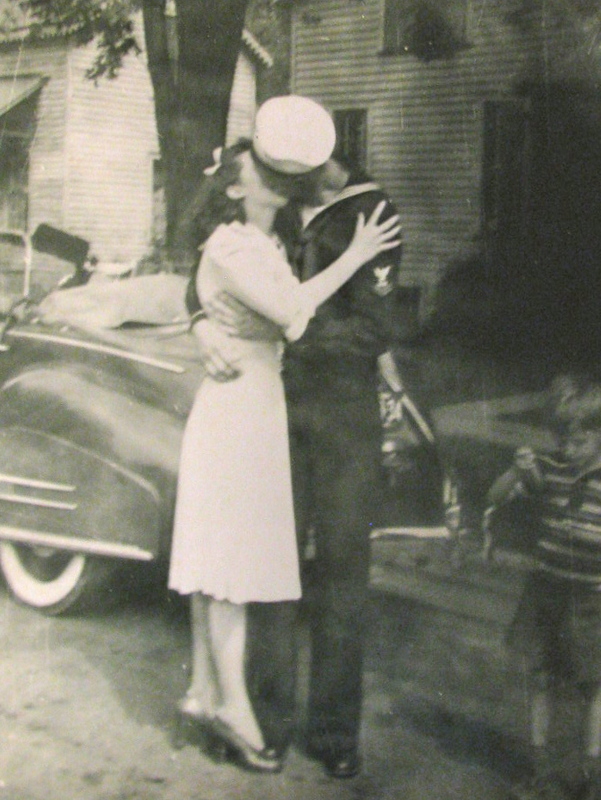 I wanted to be with my wife, Frances, because we had just gotten married right before the Intrepid sailed into battle,” Sauer explained with a smile. “They put a temporary rudder on the carrier when we reached Pearl so we could sail for Hunter’s Point in San Francisco, Calif. for a complete repair job,” he said. “It took us a long time to reach Hunter’s Point because we were pretty well messed up. “When I got to the repair base at Hunter’s Point I took a slow train back home to Bay City, Mich. where my wife was waiting at her folks’ house. It took me five days to go from San Francisco to Bay City,” he recalled. 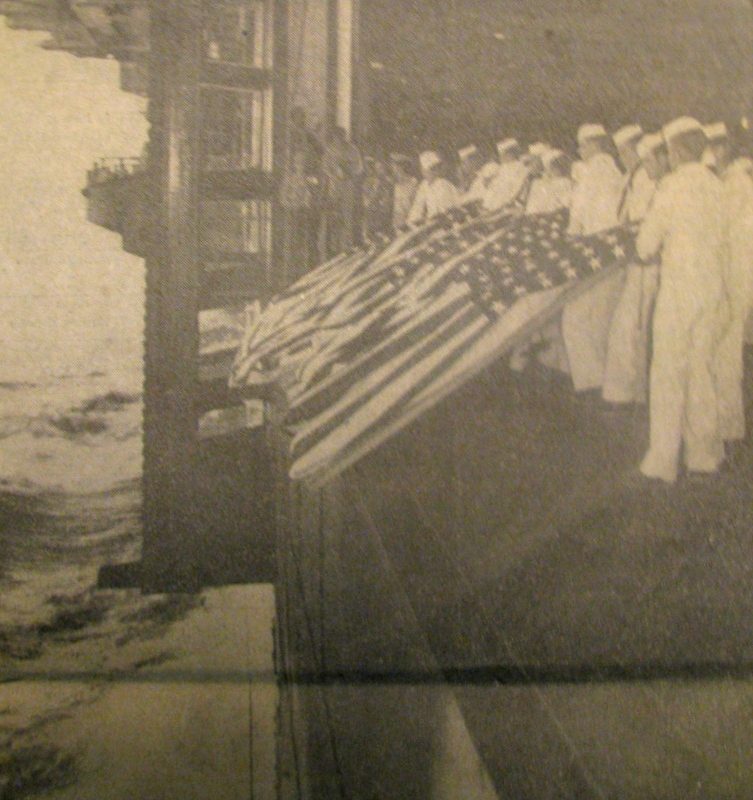 In June 1944 the Intrepid and its crew left San Francisco for Pearl Harbor and the war in the Pacific once more. Beginning on the morning of Oct. 24, 1944 we attacked a number of enemy ships. By the time Sauer left the Intrepid the carrier had taken five kamikaze hits. Aircraft from the Intrepid spotted the Yamato, Vice Adm. Takeo Kurita’s flag ship. It was the largest battleship ever built with 18.2 inch main guns. These pilots began a day-long harassment of the mighty leviathan that sustained wave after wave of attacks from the Intrepid’s planes. 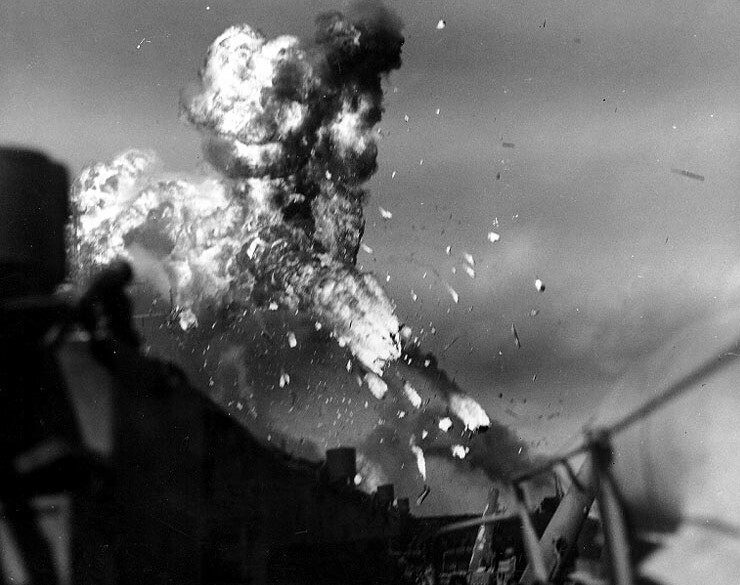 The Yamato was damaged in these attacks, but not put out of commission by American air power. However, they did sink the Musashi, another Japanese battleship in Leyte Gulf. Halsey’s fleet hit the light carrier Zuiho off Cape Engano. Bombers from the Allied force also sank her sister carrier Chitose. The battleships Nagato and Haruna and the Japanese heavy cruisers: Myoko and Haruna were badly damaged and had to give up the fight and sail for Tokyo. “We got word the Japanese were sending a second fleet to recapture the Philippines. Halsey and his battle group, including the Intrepid, sailed north in the Pacific to intercept the second Japanese fleet,” Sauer said. The Japanese Northern Force was located off Luzon. At sunup the Intrepid’s carrier-based planes took to the air and found the Japanese force off Cape Engano. They were successful in bombing the light crier Zuiho. Her sister carrier, Chitose, was sunk by American bombers. The Japanese main carrier Zuikaka was badly damaged by a torpedo dropped by one of Intrepid’s torpedo bombers. Before it was over the destroyer Akizuki was sunk and at least 15 enemy aircraft were splashed. 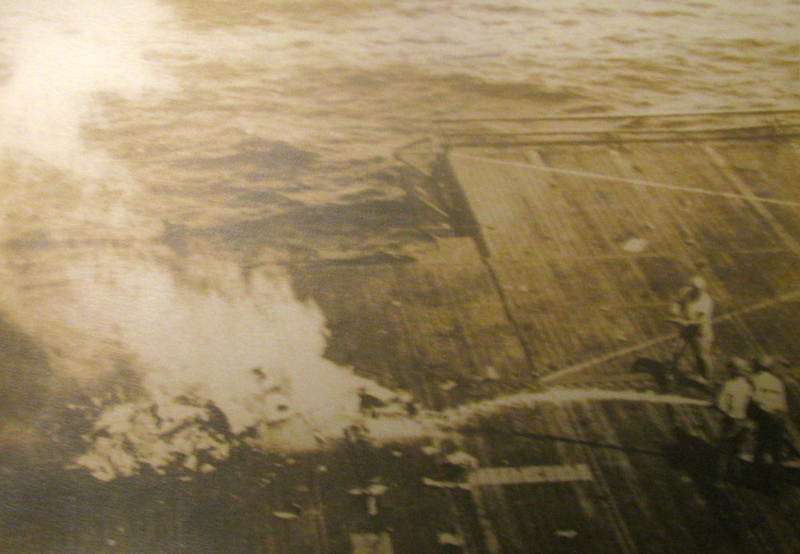 On Nov. 25, 1944 a large force of kamikazes attacked the Intrepid off the Philippines. Within five minutes two suicide planes had crashed into the carrier killing five officers and six sailors. By the time the enemy attack on the fleet was over, the Intrepid had lost 60 men, 18 were missing and the wounded totaled 100 more. Some time during the war the fleet went through a typhoon. “We got word a typhoon was coming our way. The fleet went to sea and ran right into the it. It was unbelievable,” Sauer said. “We were on general quarters all the time day and night. The ship made weird sounds continuously. The Intrepid’s flight deck plates that crossed one another squeaked and squawked. After the casualties and the battle damage off the Philippines, the Intrepid headed for repairs in San Francisco on Nov. 26, 1944. It took the damaged carrier almost a month to reach Hunter’s Point where she went into dry dock. By mid-February 1945 she was ready for battle once more and steamed for Ulithi Atoll in the Pacific. 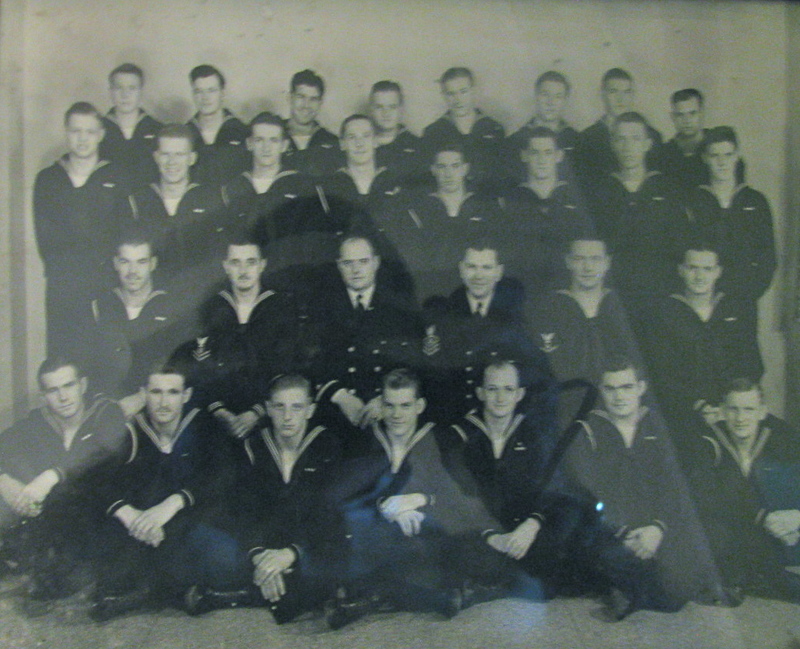 This time Aviation Electrician’s Mate 1st Class Fred Sauer didn’t go with the fabled carrier. 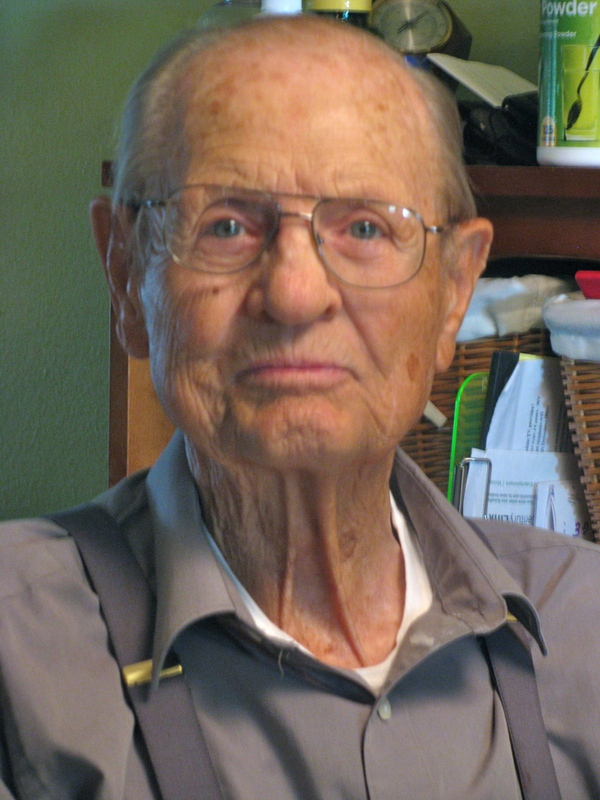 He came home to Bay City and went to work as a machinist for the same firm he had worked for as a teenager before the war. Unfortunately, his back problems flared up and he had to quit his job. Eventually he went back north and took a job as superintendent of a crane company in the Bay City, Mich. area. After a few years Florida beckoned once more and he and his wife, Frances, moved to Arcadia in 1971 where he became an vocational instructor at Florida Correctional Institute outside town. The Sauers’ have five children: Gary, Twyla, Ronald, Rob and Roland. A letter from the Bureau of Naval Personnel dated 9 July 1946 talks about Fred Sauer’s commendations noting: “The records of the Bureau show you performed 21 months sea duty and three months duty in Puerto Rico. I have addressed this letter to reach you after all the formalities of your separation from active service are completed. I have done so because, without formally but as clearly as I know how to say it, I want the Navy’s pride in you, which it is my privilege to express, to reach into your civilian life and to remain with you always. No other Navy at any time has done so much. For your part in these achievements you deserve to be proud as long as you live. The Nation which you served a time of crisis will remember you with gratitude. The best wishes of the Navy go with you into civilian life. Good luck! Death: 6 June 2017 in Arcadia, Fla. This story was first published in the Charlotte Sun newspaper, Port Charlotte, Florida on Monday, Nov. 12, 2012 and is republished with permission. Click here to view Sauer’s collection in the Library of Congress. The Intrepid was launched in April 1943 and headed for the Marshall Islands to participate in Operation Flintlock in in January 1944, not 1943 as the article states. Thank you for the correction. Thank you for reading War Tales. We will be visiting the USS Intrepid in the fall of 2013, it will be nice to put a face on one of the many young men who served on her. We only saw her this past fall while on cruise (we were embarked on a cruise next to her) and she is an impressive carrier. Fred Sauer, USS Intrepid Plank Owner and my grandfather, passed 0200 this morning 2017-06-06. Fair winds and following seas grandpa. My sincere condolences to you and your family. I recall your grandfather told a good story. You should be very proud of your him for his service during World War II. It’s not many veterans who could say they served in 9 major battles during that war but your grandfather could. Please let me know when there’s a published obituary online and we’ll include it at the bottom of his page. You’ll notice a few changes on this page were done today. Check your private messages on FaceBook.